If you're looking for a quality electrical store in the Elgin area then look no further than the experts here at Morgans Of Lossiemouth. Established in the early 1970s we specialise in the supply and installation of a wide range of Digital TV equipment, TV aerials and satellite systems: as well as a full range of domestic appliances from leading manufacturers. We stock appliances from Bosch, Zanussi, Blomberg, Panasonic, Hotpoint, Lec and Beko. We also have a range of built in appliances and offer a full installation service. 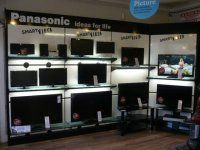 In our TV department you will find the latest Panasonic Viera flat panel TVs; ranging from 24 inch LED screens to massive 65 inch models. At Morgans Of Lossiemouth we offer a full installation service including wall mounting of our flat TVs and any aerial upgrading or satellite work necessary. All work is carried out by our own friendly, professional team. Visit our showroom at 61 Clifton Road, Lossiemouth IV31 6DP where free, on street parking allows you to take your time and let us help you choose the perfect appliance to suit your needs. So, for digital upgrades, new aerial systems, Freesat or Freeview, call us today on 01343 813273 or Text 07552 049 102 or contact us through the handy form on our "contact us" page.